Engineered for day-in, day-out 24/7 Internet connectivity, the Integrated Business Series products extend the benefits of WiPipe technology across the router and the modem, ensuring reliable connections when you need them. 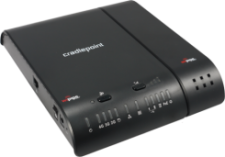 The CBA750B can also run in router mode with access to CradlePoint’s powerful suite of routing capabilities. Power-Over-Ethernet enables flexible mounting location and external high-gain antennas ensure optimal performance in areas of low signal strength.